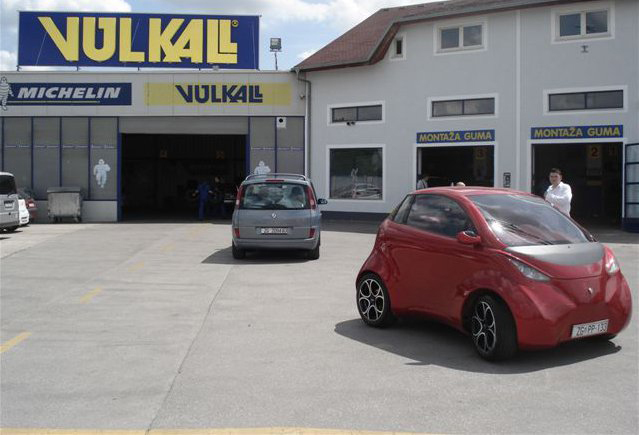 PADOVA, ITALY – June 28, 2010: DOK-ING and Vulkall, the leading tire and wheel retailer in Croatia, made the agreement with OZ S.p.A. for future supplies of XD electric city car. In the production stage XD will be set with prestigious Italian OZ wheels and top Michelin, Pirelli or Bridgestone tires. The DOK-ING company, famous in the world for its production of robotic mine clearance and fire-fighting systems, initiated the concept of the first Croatian urban electric vehicle XD in 2009. So far the company developed various prototypes of electric machines intended for use in mine clearance, mining industry and fire fighting. The presentation of the first Croatian electric car XD concept took place on the Geneva Auto Show 2010. It has been pointed out in organizer’s official reports as an example of good approach in electric car concepts, defying the generally established opinion qualifying them as slow and uncomfortable. It has drawn a great attention of both the visitors and investors the very opening day, as reported by a great number of media. Due to the very positive reactions from investors in XD project, Dok-ing team has announced the start of serial production of the electric car XD. Doking vision that the world needs to be presented with an attractive, comfortable and spirited urban car, 'battery powered' of great autonomy, has proved to be right. Oz, careful to environmental themes, is pleasant to cooperate to this project setting electric city car XD with its wheels.